If you are based outside of the UK we now offer a quick delivery service to many European destinations at competitive rates. See delivery charges below for your region. All none UK customers must provide a valid VAT number for export. If you are using your own shipping company we will require a VAT deposit, which will be refunded when we receive the relevant proof of shipping documents. A&K hosiery offers a Fast Delivery Service to all our European partners at very competitive rates, with daily shipments to Germany, France, Italy, Poland, Sweden, Spain, Portugal, Malta and most European areas. We have a superb range of products for your business at what we believe are the cheapest prices in Europe. We use the most reliable Couriers including Parcel Force and DPD giving you the most up to date tracking facilities. 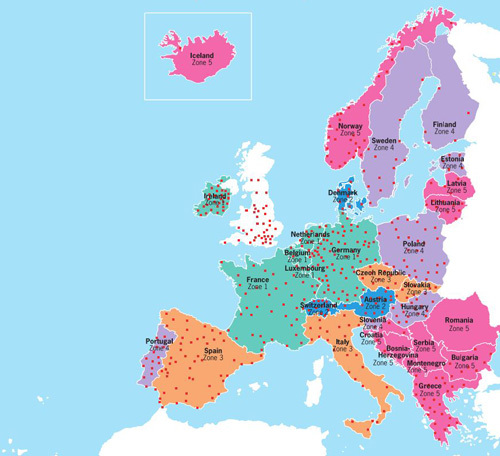 Our European Delivery Service represents excellent value for money for your business, whether its a single carton or several pallets, A&K hosiery provides all our European customers with a quick and effective delivery solution. It really is easy to get your Trade Shipments delivered promptly from A&K hosiery. Check out our Quick Quotes and see just how soon you can have your goods delivered at fantastic low rates and the peace of mind that you are getting very best service with optimum efficiency and reliability. If you are not English speaking that is not a problem, we have the latest translation tools available. Our team are standing by to process your order with prices to France, Germany & Spain starting from as little as £7 pounds per carton. It is important that you use a professional, and reputable transport company. If the documents you supply for HMRC are not compliant with current legislation, A&K hosiery become responsible for the Vat, and we will not be able to issue a refund. Please find below a map of our shipping zones. We feel our carriage charges are very competitive but if you would like to arrange for a carrier of your choice to collect the goods from our warehouse, please contact a team member to confirm. Evidence required for shipment of goods outside the EC. A&K Hosiery Ltd require every aspect of the details below to be fulfilled in order to exempt your purchase from VAT. The information below is in part extracted from HMRC current documents. Please note we are unable to Refund Vat on goods that are dispatched to a UK address, other than a Registered Shipping company. We will charge a VAT deposit in full, for all standard rate goods, and will refund this once we have all the information below on file. We also require an email acknowledgement from you, that you have read and full understand the details below. Evidence must show the goods we supplied have left the EC. Name of ferry or shipping company and date of sailing or airway number and airport.